Erik Wiegand and Michael Fiedler have released on average less than one MMM record every two years since their 1996 debut, but despite this torturously slow rate of return for their fans, they have attained a highly respected position within their field. This too in the face of the fact that their music often sounds so simplistic that you wonder if they are not playing some kind of slick sonic joke on their listeners. But there is no denying the efficacy of their tracks to move you on a dance floor, mete out severe cranial damage and just generally mess with your synapses. 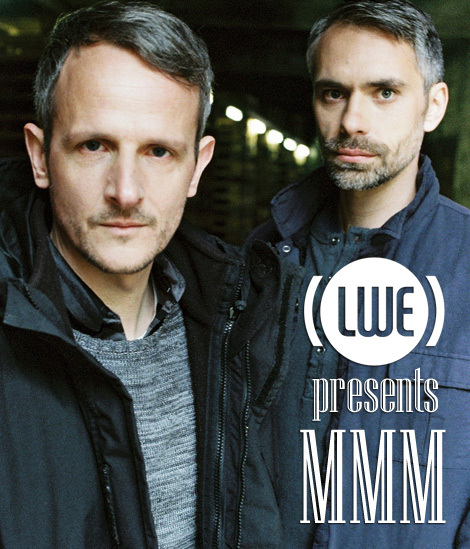 LWE recently put some questions to the duo and found out more about their approach to making music, Erik’s involvement in creating soft synths for Native Instruments, and what each of the producers have in store for us with their solo projects and as MMM. They also gave us an advance preview of their forthcoming treats with an exclusive mix of their own work and that of some of their favored peers. First of all, how did the two of you meet and what were you each doing musically already at that point? MMM: A common DJ friend called Niplz introduced us in 1994. Erik had made music since his teenage days, but hadn’t released anything yet. After moving to Berlin in ’91 he built a small home studio and started to produce dance tracks. Fiedel was DJing and organizing parties, and he was a regular at Subversiv, an underground gay club in a squat. His musical focus at this time was mainly Detroit techno and electro stuff. What was the common musical thread that made you decide to work with each other? We liked what the other was doing music wise. So we tried to make music together. We had a jam approach where we used the studio as our instrument. We turned knobs of analogue synthesizers, switched patterns, we mixed on the fly, recorded the jam on DAT and cut it on the PC. It worked out very well to jam with four hands instead of two. You had two great releases before you took a break from making music together. What was MMM to you at this stage? Had you planned out the project at all or was it just the result of two friends making music? MMM was our platform to release our music, whenever we had something to release. We avoided the pressure of release schedules. That’s why we preferred to release it on our own via Hard Wax. The pause wasn’t planned. It just happened. Our circumstances changed. What brought about the two of you working together as MMM more often again? We had time and inspiration to turn the knobs together again. The first results were the Anniversary EP with Soundhack and a live set, triggered by an invitation to play at a Numbers party in Glasgow. Has anything changed for you in how you make MMM tracks now as opposed to the earlier days? Back in the days we mainly used analogue gear. Now we work with a computer for almost everything, using a lot of Erik’s Reaktor instruments. But the jam approach is still valid. Is music your main occupation for both of you? Yes, we both produce music, perform live, and DJ. Erik develops synthesizers. Fiedel also is also part of Wax Treatment, organizing events and taking care of the mighty Killasan Soundsystem. MMM releases have a stark, almost crude simplicity to the melodies used. Would it be fair to say you focus more on sound design rather than creating complex rhythmic structures? What is the driving force behind the MMM sound? We like to modulate sounds over time in an expressive way. That is what keeps the track running; it gives the structure of the track. Such modulations can create complexity too. But yes, we like to keep tracks as simple as possible. To us that’s the definition of a good club track. Simple but enough in it to make it work. There should be something special to it too, a certain twist, an idea that draws one’s attention. Michael, you have started releasing your own solo work in the past few years. Had you always been making music on your own before or only in collaboration with Erik? First I used to make music only in collaboration with Erik. But there were my own ideas that I wanted to develop and therefore I started with my own label Fiedelone. The second release on your own label was from Your Silent Face. Will there be any other artists on MMM or is that strictly for the two of you? As a release platform for collaboration projects I set up Fiedeltwo. Fiedelone is just for my own solo productions. On MMM there will be only our own material. Must be coincidence. We listen to different styles of music. That’s where we get our influences from. We work with elements which are inspiring to us or might fit to what we already have. There is no real plan. Erik you were behind the Razor plug-in for Native Instruments. What has been your history in synths and software and how did the Razor come about? I constantly develop synthesizers with Reaktor that I use for music productions. For some years I worked at Native Instruments doing Reaktor related stuff, and later I contributed instruments to the library of Reaktor. Since a few years Native can also sell instruments made with Reaktor as a separate product. I had this idea for an additive synth and convinced them that we should release it this way. Then I developed Razor in partnership with them. I was listening to your recent Boiler Room mix the other day, Erik, and it hinted that you might have a couple of new Errorsmith releases coming. Is that true? Yes I am working on it. There must be a new Errorsmith release this year. I swore it to myself. It’s looking good. It’s been 10 years now without a release. An awkward anniversary. And you guys just released your Jack 7 12″. Is there more to come from MMM this year too? We are busy working on an album and we are hoping for a single release from that this year. We did the mix back to back playing tracks that we currently like including the new MMM and upcoming releases from us. Big up to all the artists for their great music!